Siéntete como si hubieras viajado en el tiempo a las ruinas de la Antigua Ostia que están muy bien conservadas. Este complejo arqueológico, a veces denominado "La mejor Pompeya", presenta restos de una ciudad romana que alguna vez fue gloriosa e incluye baños, tabernas, mercados de casas y un impresionante anfiteatro. 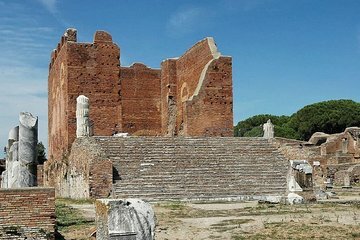 En esta excursión de medio día, viaje en una minivan con aire acondicionado con un pequeño grupo y conozca la fascinante historia de Ostia en una visita guiada. Tour de medio día desde Roma a la Antigua Ostia. Aprende sobre la vida en el antiguo imperio mientras paseas entre los restos de casas de baños, apartamentos, mercados y teatros. Viajar en una minivan con aire acondicionado. This was an excellent tour! Our tour guide was very knowledgeable and we learned a lot about the various points in history that Ostia played. The mosaics are amazing! Really liked having the hotel pick-up/return feature of this tour -made it very easy! Our guide was well versed in the history of the city and being in a small group was great. The drive was pleasant and gave you a chance to see the area outside of Rome proper. Fascinating to see how well the Romans laid out the city and to see the extensive tile works in one of the baths was marvelous. Nice break from the hustle and bustle of Rome. Our guide was amazing and very knowledgeable. The small size enabled the guide to answer all our questions and the pace was set by us. I would recommend this tour to anyone. Amazing tour, our guide Emiliano Grasso was excellent. He provided a great commentary on all the buildings and sites we visited. The city was not crowded and is a short ride from Rome. We really enjoyed hearing the history and seeing the buildings, the baths and the mosaics. If you like getting up close and personal to history then this tour is for you. There is a place to buy gifts as well as a food cafe and a museum. A absolutely fantastic experience. So much to see and take in our guide, Emiliano was personable and knowledgeable. He also gave us time on our own whenever we wanted or needed it. Very customer focused. Dropped us of at Saint Clements at our request instead of back at our hotel, this saved us time and effort. Much appreciated. Well done Emiliano, thanks from Gerard and Sylvia. Very interesting well worth the trip out there from Rome. Donald was most accomadating to all of us even our handicap 3. He took his time answered questions. Was a good time. Our tour guide, Emilio, was very well-versed and passionate about the history of Ostia Antica. His friendly demeanor and fluent English made this in-depth tour very enjoyable, grazie Emilio! Ended up being a private trip for our group of 6 in a comfortable, air-conditioned minivan. Emilio, our tour guide, took cues from the group as to our pace and interests. He was pleasant and professional as he shared the history of ancient Ostia and took time to answer individual questions. Took a break at the cafeteria and gave us time for snacks with no pressure to be at the bus by X time. Relaxed and friendly. By far, one of the best tours I've ever taken. Very nice tour with a comprehensive look at an ancient city, different than Rome because nothing has been built over the top of it. Our guide back to ancient Ostia was Donald, who did a terrific job infusing us with his passion for the cite. We have been quite satisfied with all the tours we booked with Viator as well as their service: website, communications, changes, confirmations, etc. everything went smoothly making our trip that much more enjoyable.